Tether Limited is a platform based on the Bitcoin blockchain and operates through the Omni Layer platform protocol. It offers a cryptocurrency that operates based on a Proof of Reserves mechanism based on the ‘USD standard’, meaning that Tether USDT ensures that it has at least enough USD in its coffers in Hong Kong to back up its USD Tether (USDT) token a 1:1 ratio. In this way, they aim to provide a stable, reliable cryptocurrency to blockchain users, as opposed to the more volatile cryptocurrencies that currently dominate the market. Tether is semi-decentralized platform, as while records and transactions are stored on distributed ledgers on the blockchain, Tether itself is a centralized platform, as the USD fiat currency needs to be stored and distributed from a centralized source by a trusted custodian. Tether Limited plans to provide trust by establishing regular audits of both their fiat and cryptocurrency holdings by trusted third parties. In the future, Tether hopes to create a more decentralized system through various mechanisms such as direct transactions through mobile apps and exchanges, and the implementation of a transparent multi-sig authentication system. 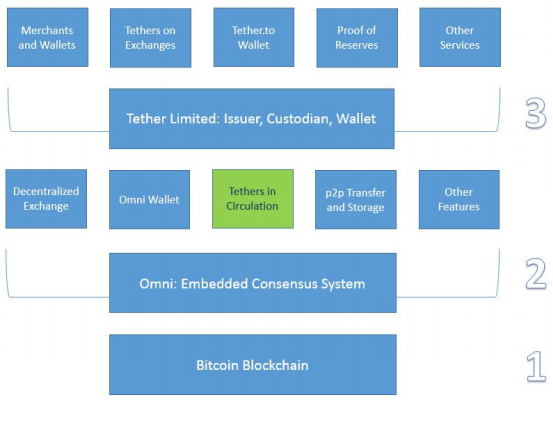 Bitcoin blockchain – Tether’s transaction ledgers are distributed and stored in the Bitcoin blockchain by means of Omni Layer’s consensus protocol. a) The creation and destruction of USDT token meta-data that is stored in the Bitcoin blockchain. c) Allowing for transactions of USDT tokens and relevant currencies across multiple platforms by use of Omni Layer compliant wallets. c) And, integrating and maintaining Tether token supply and circulation within the Blockchain ecosystem. And, Tether Limited then burns the tokens and transfers the equivalent fiat value of fiat currency back to the User. USDT tokens can be purchased directly from Tether’s online platform or certain exchanges for either fiat currencies or Bitcoin, at the relevant USD:Currency rate. However, these tokens can only be stored on Omni Layer compliant wallets. Tether Limited’s role as the centralized force behind the Tether token system necessitates a system to ensure full disclosure and transparency for the functioning and dependability of their platform. Due to the unreliability of current blockchain based auditing mechanisms. For this reason, Tether Limited has adopted a Proof of Reserves protocol that verifies that each USDT token has a real fiat USD held in reserve at a 1:1 ratio. This ratio will be authenticated through the recording of all transactions, issuances and removals of USDT on the Bitcoin blockchain, as well as periodic public publishing of Tether Limited’s bank balance and third party professional audits. The system of transparency and accountability outlined above is what forms the basis of USDTs widespread adoption and use in the cryptocurrency market space. However, this trust was brought into question when it was discovered that the United States Commodity Futures Trading Commission had issued a subpoena against Tether in December 2017, in light of their 10,000%-unit growth over the space of a year. This concern was coupled with news of the resignation of the Friedmann LLP auditing firm from completing the latest audit. 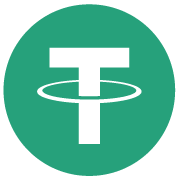 This means that Tether Limited’s claim of a 1:1 holding of USD for the approximately 2.2 billion USDT that are currently in circulation. The final findings of the CFTC will have ramifications throughout the crypto industry, as they are often used for purchasing other cryptocurrencies such as Bitcoin, meaning that if the USDT are found to be valueless, or insufficient to support the USDT currently in circulation, then all other cryptocurrencies will likely plummet as well. However to date, the USDT price has remained fairly stable, with both its lowest and highest trading values being within cents of the $1 USD mark. March 2015 – USDT is released and remains generally consistent in value, with the lowest unit value at about 0.92 USD on 27 April 2017 and the highest value at approximately 1.06 USD on 13 December 2017 (coinmarketcap). 2017 saw Tether USDT total circulating supply increase by over 10,000%.